Blimey O’ Reilly, I don’t believe it, skies were actually clear for one of this year’s astronomical highlights, so I hope you set the alarm and viewed it. I had set my camera and tripod up the previous evening, so when the phone alarm jolted me out of my slumber around 04:45h, I only had to don some warm attire and wander out into the back garden to view proceedings. Totality was centred on 05:15h and therefore the moon was already in umbral eclipse, and a beautiful sight it was too, quite light in hue, so perhaps more light was being refracted around the earth than usual. Using a SDLR 200mm lens, I tried various exposures, times and ISO’s; trial and error really, much trial and many errors, precise focussing being the bug-bear, but I managed a few half decent images. Looking around the clear sky, the spring constellations were already crossing the S meridian, with Leo and Virgo well presented. The bizarre thing was for that time of morning it didn’t actually feel that cold, and in fact it felt and looked much colder at 08:00h – just weird. By 05:30h I thought my work done and retired back to my hot water bottle and the land of nod. 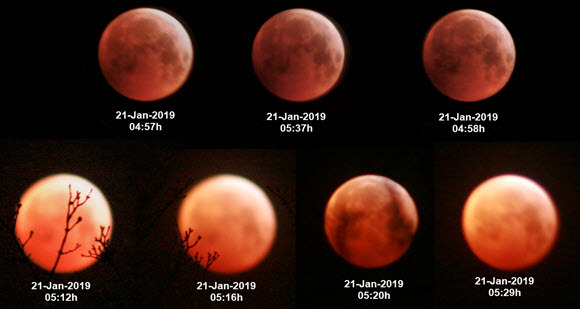 If your alarm failed to go off and you missed it, there is not another total lunar eclipse visible from the UK until May 2022, but not in entirety, for that we have to wait until the last day of 2028 and better still – from start to finish Dec 2029!